Lying in bed aboard at night can sometimes sound like you’re floating in a bowl of rice bubbles at breakfast time. 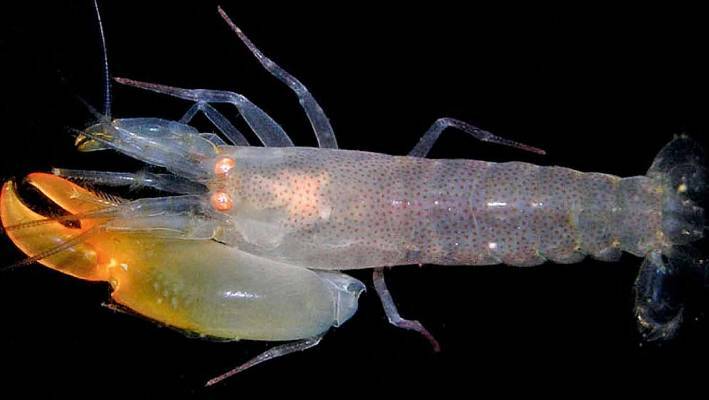 The snapping shrimp has an over-sized claw it ‘pops’ to stun small creatures which it then devours. 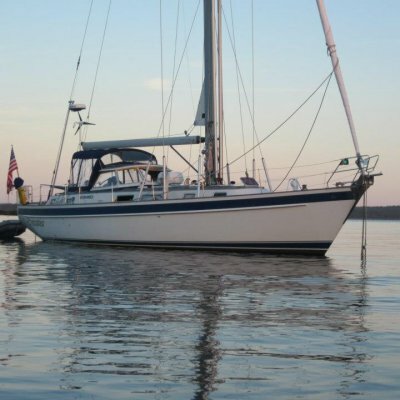 Some people imagine electrolysis happening all around them, or that the boat is being attacked by the mythical fibreglass-eating teredo worm. But the real reason for those nocturnal snap, crackle and pop noises is even weirder than that. 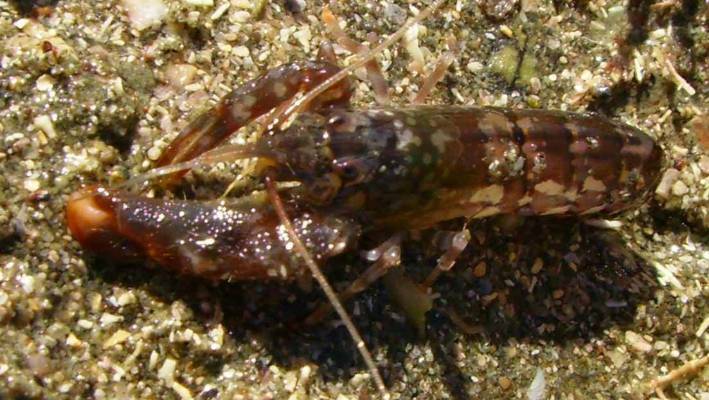 The noises are caused by the fearsome feeding habits of snapping shrimp or kowhitiwhiti moana. Several species of snapping (or pistol) shrimp are hard at work munching in various oceans round the world but New Zealand has a native version – alphaeus novazealandiae – which grows about 2-3cm long and is camouflaged to blend into its reef and rocky habitat. The snapping shrimp’s biggest departure from other shrimps is its huge claw, like a giant boxing glove, which makes up about half its body weight. The claw has two parts – a flat anvil on one side and a concave scoop on the other. The shrimp snaps these together with enough force to super-compress the water caught between them. The compressed seawater heats to about 4000°C and expands, forcing out a low-pressure cavitation bubble at speeds up to 100km/h. As the bubble de-pressurises, it expands and bursts – causing the loud popping noise which keeps seafarers awake and wondering in their bunks. SUPPLIED The New Zealand snapping shrimp grows to about 3cm long and lives among rocks and reef. Scientists say the noise can reach 218dB (a rock concert would be around 150dB) and that the force required to make it is greater than any man-made device can produce, weight for weight. The bursting bubble and the accompanying pressure wave stuns the shrimp’s prey – small fish and marine organisms – which it then drags back into its burrow to eat at leisure. World War II submariners first recognised the phenomenon because the shrimp chorus interfered with sonar echoes and they would seek out concentrations of snapping shrimp to create an underwater hideaway from surface trackers. 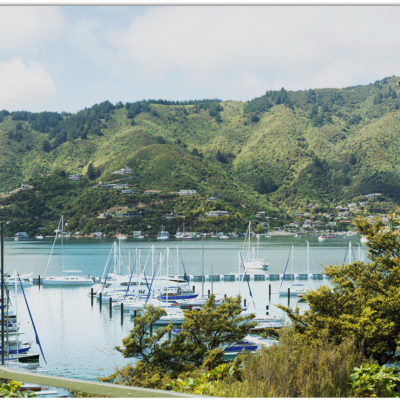 New Zealand was already known to have some of the noisiest reef life in the world; kina make popping noises, gurnard growl, grunt and groan and john dory bark like a dog. 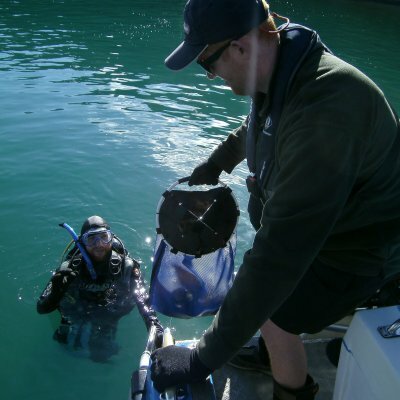 But it wasn’t until the Royal New Zealand Navy set up a hydrophone on Great Barrier Island in 1958 to monitor ship and submarine traffic in the Pacific that scientists began to study the shrimp in earnest. They identified three separate noise types in the pristine reefs off the eastern side of the island which they termed “morning”, “barnyard” and “evening” choruses and realised the shrimps’ role in creating them. At first they thought the noise was created by shrimp claws clacking together with great force, but when cameras capable of taking 4,000 frames per second became available they revealed the bursting bubble produced in a process taking about 10 nanoseconds. It is also thought that the superheat generated in the claws cooks the micro-organisms in the seawater which are then expelled to be gobbled by the shrimp. But this seems anthropomorphic to me – what other marine crustacean bothers to cook its food for consumption? If the big claw is lost or damaged, the ambidextrous shrimp grows the smaller claw to take its place. Lying in bed aboard, listening to the shrimps at work, is time to speculate about giant, mutant snapping shrimp. For centuries the only squid we knew about were the regulation size creatures feeding on school fish. But, as deep water fishing technology improved, firstly giant, then colossal squid were dragged from their deep water habitats. A colossal snapping shrimp? Who knows what’s down there? There are 620 recognised species of snapping shrimp in the Alpheidae family, which has 45 or more genera spread through the world’s oceans. Around 283 species belong in the biggest genus, Alpheus, including our native snapping shrimp. Synalpheus is the next biggest genus with 146 species, some of which are social creatures. Synalpheus regalis lives in colonies of up to 300 members inside sponges. All are offspring of a single large female. Rather like ants, the colony is divided into a single queen, numerous workers to care for the young and male soldiers to protect the colony. Most Alpheus species are solitary, although some share burrows with gobies in a symbiotic relationship. Alpheus species favour tropical and subtropical oceans. 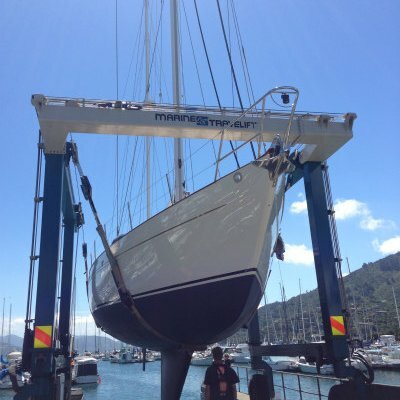 With thanks to our friends at Boating NZ magazine for their kind permission to reproduce this article.